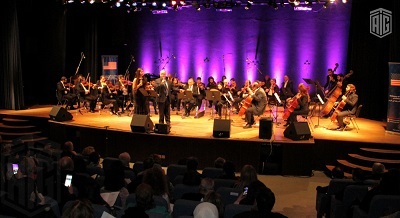 AMMAN – On Sunday, January 15, musicians from JOrchestra and Oberlin Conservatory and the singer Attallah Hindeleh performed in a public concert entitled, “Musical Crossroads: Melodies from the U.S. and the Orient” under the joint patronage of Ambassador Alice G. Wells and Dr. Talal Abu Ghazaleh. The concert was a collaborative performance during which the musicians performed both Arabic traditional songs and jazz works. The Oberlin Conservatory is one of the most prestigious music conservatories in the U.S. and indeed the world. It is the oldest continuously operating Conservatory of Music in the United States, and a recipient of the National Medal of Arts. The eight musicians from Oberlin are visiting Jordan as part of a cultural exchange, to experience and learn from Jordanian cultural and musical traditions, and share their musical talents. The musicians expressed their deep appreciation for the hospitality of their new Jordanian friends, and the chance to experience Jordan’s unique and captivating cultural heritage as they visited major historic sites across the country. Attallah Hindeleh graduated in Musical education at Halwan University in Cairo, taught music in schools from 1979 until 1988 and was an Arabic singing teacher at the National Conservatory from 1999 until 2001. He has participated in a number of festivals on different occasions, amongst which are the Jerash Festivals in Jordan, the Arab Theatre Festival in Cairo and the University Festival in Morocco and he has also performed in several revivals of the renowned Arab artist, Abd Al Halim Hafeth. Mr. Luay Abu-Ghazaleh, representing Dr. Talal Abu-Ghazleh, Chairman of The Jordanian National Orchestra, introduced the concert with the inspiring poetry The Ballad of East and West Rudyard Kipling: “Oh, East is East and West is West, and never the twain shall meet, Till Earth and Sky stand presently at God's great Judgment Seat; But there is neither East nor West, Border, nor Breed, nor Birth,When two strong men stand face to face, though they come from the ends of the earth!”. Abu-Ghazaleh’s opening remarks were followed by The U.S. Ambassador to Jordan’s touching speech: “It has been my pleasure to serve on the Board of Directors of JOrchestra over the past year. I have been moved by the energy and dedication of Dr. Talal Abu Ghazaleh, his dream to bring world-class music to Jordan, and his support for this orchestra and their endeavors. America’s first diplomat, Thomas Jefferson was also a lover of music who supported and encouraged the playing of music, much like Dr. Abu Ghazaleh has done here in Jordan. Thomas Jefferson himself played violin and cello, claiming to practice three hours each day. How he could do this while writing the Declaration of Independence or serving as President or Secretary of State is difficult to imagine, I am impressed. But his commitment to music while having so many other things on his plate makes you wonder whether we sufficiently value the role of music in the interplay between diplomacy, politics, and culture, and as a common tie that binds us together. We are all enriched by the exchange of culture and ideas on evenings like this, and I am sure many a lasting friendship has been born in concert halls and theaters like this one. In addition to the very talented musicians that make up JOrchestra, we are pleased to welcome tonight eight American students from the Oberlin Conservatory of Music, who have traveled to Jordan as cultural diplomats during their semester break to share their talents, experience, and culture with you and with musicians and music students in Jordan. The Oberlin Conservatory is one the best schools of music in the United States so these are not just ordinary students – they are some of America’s best and brightest. As the oldest continuously operating Conservatory of Music in the United States, and a recipient of the National Medal of Arts, we are lucky to have the opportunity to listen to you tonight. Thank you so much for sharing your talents with us. Tonight’s event, entitled, “Musical Crossroads: Melodies from the U.S. and the Orient,” is intended to blend and celebrate music and talent that transcend any differences of culture or nationality,whether through the classical music of European greats, American Jazz pieces, or a number of classics from this region featuring the voice of Jordanian legend, Attallah Hindeleh”. Musical Crossroads was a full house concert enjoyed by both, the local and international community. Largest INTA Annual Meeting in the last 137 years!